This is the documentation for mxODBC Django Database Engine in HTML format. A PDF version is available for printing and offline use. mxODBC has proven to be the most stable and versatile ODBC interface available for Python. It has been in production use since 1997 and is actively maintained by eGenix.com to meet the requirements of modern database applications which our customers have built on top of mxODBC. Djangois a high-level Python Web framework that encourages rapid development with a clean and pragmatic design. ORM support for other popular database backends will be added in upcoming releases. Databases for which we currently do not provide ORM support can be used by directly building on top of the Python DB-API 2.0 compatible mxODBC Database API. Please see section 5.2Direct mxODBC Database Interfacing for details. This manual explains how to setup mxODBC Django Database Engine for your Django web application. It is written as a technical manual, so some knowledge of Python and the basic configuration of Django is needed. ● Fully integrated with the Django ORM: No need to learn a new API - simply continue to use the known Django ORM interface. ● Compatible with all current Django versions: The mxODBC Django Database Engine supports Django 1.4 and 1.5. ● Compatible with all recommended Python versions: The database engine supports Python 2.6 and 2.7; both as UCS2 (narrow) and UCS4 (wide) Unicode variant on Unix platforms. ● Full Unicode Support: The database engine can communicate with the database using native Unicode and 8-bit encodings such as UTF-8 or CP1252. ● Full 64-bit Support: The underlying mxODBC 3.2 library fully supports 64-bit platforms such as Mac OS X 10.6 (Snow Leopard) and 64-bit Linux systems that use unixODBC, iODBC or DataDirect ODBC managers. ● Cross-platform Connection Objects: The database engine will automatically choose the right platform specific ODBC manager for you. ● Per Connection Adjustable ODBC Manager Interface: mxODBC supports many different ODBC managers. The mxODBC Django Database Engine allows you to select the ODBC manager on a per-connection basis. ● Per Connection Customization of Interface Parameters: The database engines allows adjusting many different parameters to adapt the engine to your specific database needs, should you have special requirements. ● MS SQL Server fully integrated into the Django ORM: Access MS SQL Server through the Django ORM, just like any other Django ORM database. ● MS SQL Server Regular Expression Emulation: Even though MS SQL Server itself does not support regular expressions, the mxODBC Django Database Engine provides an emulation for simple regular expressions to simplify porting existing applications to a SQL Server backend. ● MS SQL Server Aggregate Function Support: We provide a special aggregate function implementation to have the Django ORM support SQL Server aggregate functions. ● MS SQL Server Timestamp Support: SQL Server support millisecond accuracy on timestamps. The database engine will take care of applying the necessary rounding for the microsecond precision Python timestamps in a seamless way. ● Support for all popular SQL Server ODBC drivers: The mxODBC Django Database Engine supports the MS SQL Server Native Client on Windows, the MS SQL Server Native Client for Linux, as well as the FreeTDS ODBC driver. Commercial drivers from well-known driver vendors are also supported. ● Support for accessing SQL Server from Windows and Unix platforms: On Windows and Linux you can use the SQL Server Native Client, on other Unix platforms and Mac OS X, the FreeTDS or commercial drivers can be used. ● Access IBM DB2, Sybase ASE, Oracle, Teradata, Netezza, etc. directly through the proven mxODBC Database API: Import, query and save data directly to the databases using a simple to use API and all available database specific SQL dialects, capabilities and features, including ones for which the Django ORM does not provide support. ● Fully Python DB-API 2.0 compatible interface: mxODBC support the Python DB-API 2.0, including many standard extensions and the full set of ODBC catalog methods for database introspection. ● Full transaction control: When using the mxODBC Database API, you get full control over the database connections, including opening them on demand, in auto-commit mode, dynamically scaling the number of connections per request, etc. The mxODBC Django Database Engine package provides ORM integration subpackages for each database backend. In version 1.2 of the mxODBC Django Database Engine we provide support for Microsoft SQL Server 2005, 2008 and 2012 through the subpackage mxodbc_django.ms_sql_server. For later versions of the product, we plan to add subpackages for other database backends such as Sybase, IBM DB2 and Oracle as well. The mxODBC Django Database Engine can be used just like most other database backends shipped with Django. We have added some additional options and features that allow adjusting the engine to your specific needs, but the defaults should work for most installations. Configuring Django to use one of the available mxODBC Django Database Engine ORM subpackages only requires changes to your application specific settings.py file. Some features of the Django ORM may not be supported on all the database backends due to differences between the supported set of data types and operators of the underlying database servers or database server versions. The Django project is a quickly evolving web framework. eGenix generally tries to keep up to date with the latest supported releases of Django, but since new Django versions often introduce subtle differences in the internal Django APIs that the mxODBC Django Database Engine has to interface to, upwards compatibility is not always guaranteed. It may also work with older Django versions, as far back as Django 1.2, but those versions are no longer supported by eGenix. Support for future Django version depends on the way Django is developed. In the past, changes to the Django APIs have often made it necessary to adapt the mxODBC Django Database Engine to the new versions, so you can not expect the package to be forward compatible. ● All 32-bit Windows platforms starting with Windows 2000 are supported. 64-bit versions Windows Vista x64 and later are supported as well. ● Django 1.4 or 1.5 needs to be installed and working. ● Python 2.6 or 2.7 needs to be installed and working. You normally have one of these Python versions already installed if you are using Django 1.4 or later. ● The Windows version of the mxODBC Django Database Engine uses the Windows ODBC manager as ODBC manager, so you have to configure your ODBC data sources using its GUI interface which is available through the system settings folder. ● SuSE, RedHat or Ubuntu Linux distributions, as well as FreeBSD, for x86 and x86_64 processors are supported Unix platforms. We can also provide ports and custom builds for other Unix platforms such as IBM AIX or Oracle Solaris on request. Please write to sales@egenix.com for details. ● On Linux and FreeBSD, the binary package includes support for the unixODBC and iODBC ODBC managers. On Linux, the DataDirect ODBC manager is also supported. You must have at least one of these installed in order to be able to connect to ODBC data sources. Please use the ODBC manager GUI interfaces to configure the data sources. The Django Database Engine prefers unixODBC over iODBC over DataDirect, if more than one ODBC manager is installed. ● Mac OS X 10.4/10.5 Intel and PPC 32-bit and Mac OS X 10.6 Intel 64-bit are supported. Please note that we are phasing out support for Mac OS X 10.4 and 10.5 as well as the 32-bit Intel version. ● Mac OS X uses a variant of iODBC as system ODBC manager. On Mac OS X 10.4 and 10.5 this comes pre-installed with the system. On Mac OS X 10.6 and later, the ODBC manager is available from Apple as separate download. Alternatively, you can use the new ODBC Manager which is maintained by Actual Technologies. Please use the ODBC manager GUI interfaces to configure the data sources. The mxODBC Django Database Engine package is distributed as a third party add-on for the Django Web framework. The product does not include ODBC drivers for the database. You can get these from your database vendor or one of the many third-party vendors providing ODBC drivers for many combinations of platform and database version. See the ODBC vendor list on SQLSummit.com for details. You will have to install a valid mxODBC Django Database Engine license in order to run your Django application with the backends provided by mxODBC Django Database Engine. Please do not install the eGenix packages egenix-mx-base or egenix-mxodbc separately when using the mxODBC Django Database Engine product. It already includes these packages. A separate installation is not needed and will cause conflicts. On Windows, you typically install Python using the Python MSI Installer, which places the installation details into the Windows Registry and allows the installation to be managed using the software installation manager built into Windows. Alternatively to the Windows Installer-based installation, it is also possible to install the mxODBC Django Database Engine using zc.builout, setuptools/distribute/easy_install or pip. These installation mechanism are not managed by the Windows software installation manager, so cannot be uninstalled using the Windows manager. However, they offer ways of automating the installation and uninstallation from within Python. On Unix platforms such as Linux, FreeBSD, Mac OS X, you have to use Python installation managers to install the mxODBC Django Database Engine. We support zc.builout, setuptools/distribute/easy_install or pip. eGenix distributes the mxODBC Django Database Engine in form of .egg and .prebuilt files. Both types of files are a Python binary distribution format, which allows distribution of compiled Python packages without the need for a compile step on the target machine. While .egg files work well with setuptools/distribute based easy_install and zc.buildout, the .prebuilt files are usable with the more modern pip installer. There are two ways to get the database engine installed in your Django project: an automatic approach and a manual one. The mxODBC Django Database Engine is normally distributed and installed in form of Python egg archives which are built for automatic download and made available through a special package index on the eGenix.com website. A separate manual download is normally not needed, since easy_install and zc.buildoutinstallation and build tools will automatically find and download the .egg software archives from the eGenix.com website as needed. Please note that pip does not support automatically downloading .prebuilt files. You have to use the manual download option, if you intend to use pip. If you do need to download the egg or prebuilt archives eGenix makes available, e.g. because you want to use pip, your server doesn't have Internet access, or is behind a firewall, please read on. You can download the binary egg and prebuilt archives for your combination of platform, Python version and Unicode variant from the eGenix.com web-site at http://www.egenix.com/. Please make sure that you download the right version for your Django installation. If you get import errors, notices of failed initialization or Django hangs, you likely have the wrong product version installed. All recent versions of these operating systems are supported. Just be sure to download the correct archive for your platform. On many platforms we support x86 32-bit and x86_64 64-bit versions of Python. bin/python -c "import struct; print struct.calcsize('P')*8,'bit'"
On Windows, Python is always compiled as UCS2 version, so you can skip this section. Most Django installation will be using the system's default Python installation, either directly or via a virtualenv local installation. On Linux and FreeBSD this usually means you have a UCS4 version of Python. This section explains the installation of the mxODBC Django Database Engine using a zc.buildout based approach. zc.buildout is a software configuration and setup tool that allows for a programmatic, repeatable approach to software deployment. The binary installation archives and egg files include everything you need to run the mxODBC Django Database Engine, including the necessary egenix-mx-base and egenix-mxodbc packages for Django. If you have not installed them manually in your Python installation, also make sure that you don't have any of these buildout recipes installed: collective.recipe.mxodbc or collective.recipe.mxbase. zc.buildout will automatically upgrade your mxODBC Django Database Engine to the latest release. In order to run the mxODBC Django Database Engine, you will need license files from eGenix.com. In order to install the license files, please unzip the license archive to your Django installation directory, i.e. the directory with the buildout.cfg file. zc.buildout will need to find the files for proper operation. The files will be copied to the right Django Project directory location via a zc.buildout recipe where Django can find them, so you should not remove these license directories. We assume that you have already installed Django and unzipped the license files to the installation directory as explained in the previous section. Windows users always need the UCS2 version. Mac OS X users will most likely also need the UCS2 version, since Python's default configuration is to build a UCS2 interpreter. Linux users will likely need a UCS4 build. We assume that you are using a buildout recipe similar to the djangorecipe recipe, which has a [django]section for installing Django and the Django project. # settings.py module is located. ● Adjust the egenix-mxodbc-django version to the one that you would like to use. This will rebuild your Django project using the newly added eGenix mxODBC Django Database Engine product. To complete the installation, configure a database connection to use the mxODBC Django Database Engine and restart Django. The configuration of the mxODBC Django Database Engine is explained in more detail further below. This section explains the installation of the mxODBC Django Database Engine using an easy_install based approach. easy_install is a script that is installed as part of the distribute or setuptools Python packaging system. It uses egg files which contain binary Python packages for easy installation. The binary installation egg files include everything you need to run the mxODBC Django Database Engine, including the necessary egenix-mx-base and egenix-mxodbc packages for Django. easy_install will automatically upgrade your mxODBC Django Database Engine to the latest release, if you run it with option --upgrade. If want to install or upgrade a specific release, please specify the version as requirement, e.g. easy_install egenix-mxodbc-django==1.2.0. In order to install the license files, please unzip the license archive to your Django Project and place the mxodbc_django_license. * files into the directory where your project's settings.py Django module is located. If the mxODBC Django Database Engine cannot find the license module on import, Django will give an error on startup. We assume that you have already installed Django and unzipped the license files to the project directory as explained in the previous section. You are now ready to install the eGenix Django Database Engine using easy_install. Select one of the following variants depending on the outcome of the UCS-test in the previous step. If you are using a UCS2 version of Python, please run the following command using the easy_install script corresponding to your Python installation (usually in the same directory as the pythonbinary). The above commands install the latest available version of the egenix-mxodbc-django package. If you'd like to install a specific version, please add a version restriction ("egenix-mxodbc-django==1.2.0"), e.g. 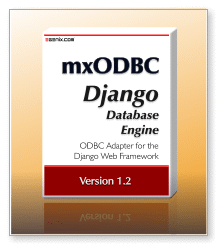 This will install version 1.2.0 of the mxODBC Django Database Engine. This section explains the installation of the mxODBC Django Database Engine using the pip package manager. pip uses a standard setup.py based approach for installation. We have created a special prebuilt binary format which supports this kind of interface and works well with pip. Please note that you have to download the .prebuilt package file from our website to install the egenix-mxodbc-django package, since pip can not automatically select the correct file for your installation platform. The binary installation prebuilt files include everything you need to run the mxODBC Django Database Engine, including the necessary egenix-mx-base and egenix-mxodbc packages for Django. To force an upgrade, please add the --upgrade option to the pip installation command below. Upgrading to a specific version is simply done by downloading and using the specific .prebuilt archive version for the installation. Using the information obtained in step 1 and the name of your installation platform, download the right .prebuilt package archive from the eGenix.com website and place it into the Django installation directory. You are now ready to install the eGenix Django Database Engine using pip. Please run the following command using the pip script corresponding to your Python installation (usually in the same directory as the python binary). This will install the mxODBC Django Database Engine. The pip installer keeps track of the files it installed for a package. This will uninstall all files that can safely be removed from the system. It will not remove files which were added to the subpackages after installation, nor will it remove the license files you manually installed. This section explains the installation of the mxODBC Django Database Engine using the native Windows MSI installer files. These installations create registry entries and can be uninstalled through the standard Windows OS Software Management tools. The MSI installers we provide allow for interactive, unattended and automated installs. Please see the Python MSI installer features page on python.org for details on available options. In order to use the MSI installers, you have to download the .msi installer file from the mxODBC Django Database Engine product page. The binary MSI installers include everything you need to run the mxODBC Django Database Engine, including the necessary egenix-mx-base and egenix-mxodbc packages for Django. When upgrading, we generally recommend uninstalling the previous installation using the Windows Software Management tools first. After the uninstall has completed, you can then proceed as usual with the installation. If you are working on a Windows x64 system, you need to determine whether you are using a 64-bit or a 32-bit build of Python on your Windows system. On Windows x86 you can skip this step, since you'll always have a 32-bit build of Python as well. The output will tell you whether your Python installation is a 32-bit or a 64-bit one. Using the information obtained in step 1 and the variant of your installation Windows platform (Windows x86 or x64), please download the right .msi installer archive from the eGenix.com website and place it into the Django installation directory. You are now ready to install the eGenix Django Database Engine. Simply double-click on the egenix-mxodbc-django-….msi file and follow the instructions. This will install the mxODBC Django Database Engine. During the installation, you have to answer a few user access control (UAC) dialogs. Depending on the installation location of Python, it may also be necessary to run the MSI file as administrator. Please note that it's better to "install for all users", since per-account installations of Python tend to cause permission problems. The Windows installer will automatically register the installed software with the standard Windows software management tool. To uninstall the mxODBC Django Database Engine, run the Windows Software Management tool and select the "Python x.x eGenix mxODBC Django Database Engine x.x" entry for deinstallation. As of version 1.5, Django does not provide database connection pooling. This can result in poor performance, since Django usually reconnects to the database on every single request. Fortunately, ODBC manager usually come with connection pooling built-in, so it's possible to work around this problem. You can turn on connection pooling in your ODBC manager's GUI, whether on Linux, Mac OS X or Windows system. If you'd rather like to enable the setting without using a GUI, please consult your ODBC manager's documentation. Enabling connection pooling in the ODBC manager can have unwanted side-effects, e.g. due to connection settings leaking across requests, which can result in the web application becoming unstable. It can also result in poor performance with some databases, so testing the setting is needed and no general recommendation can be given. Note that if you plan to run Django as Windows service, it may be necessary to setup the ODBC data sources as System-DSN. Otherwise, the Django process won't be able to see or access the ODBC data sources you setup in the Windows ODBC manager. The platform default ODBC manager (the one selected using mxodbc_manager="Manager" in the connection options) on Windows is always the Windows ODBC manager. On 64-bit Windows platforms, Windows comes with two versions of the Windows ODBC manager: a 32-bit version and a 64-bit version. The 32-bit version of mxODBC Django Database Engine will choose the 32-bit one, the 64-bit version of mxODBC Django Database Engine the 64-bit ODBC manager. On Unix (Linux or Solaris), it suffices to supply a standard ODBC INI file either as /etc/odbc.ini or in the Django user home directory as ~/.odbc.ini (note the leading '.') file which uses the same syntax as the Windows file ODBC.INI. Note that you only need to have one of these ODBC managers installed on the installation machine for the mxODBC Django Database Engine to work. The platform default ODBC manager (the one selected using mxodbc_manager="Manager" in the connection options) depends on which ODBC manager mxODBC Django Database Engine finds during startup. It select the first one found from the above given list, i.e. unixODBC, iODBC, DataDirect. If you are running on Mac OS X 10.6 and have problems finding the data sources configured with the ODBC Administrator in the mxODBC Django Database Engine data source list or connecting to them, please see this Mac Dev Center article for a fix. The platform default ODBC manager (the one selected using mxodbc_manager="Manager" in the connection options) depends on which ODBC manager mxODBC Django Database Engine finds during startup. It select the first one found from the above given list, i.e. unixODBC, iODBC. Please note that some of the following sections on ODBC drivers do not may not apply to the current version of the mxODBC Django Database Engine, since the respective database backends are not supported by the Django ORM integration. We still include them, since it is well possible to connect to these databases directly via the include underlying mxODBC Python interface. The Windows ODBC manager implements a feature called Connection Pooling which allows faster connects to databases. In some cases we have observed failures and problems when using the connection pooling feature of the ODBC manager together with the mxODBC Django Database Engine. If you are observing similar problems, we suggest that you turn off connection pooling in the Windows ODBC manager for those data sources that you wish to use the Django Database Engine for. On Unix the mxODBC Django Database Engine uses an already installed iODBC, unixODBC or DataDirect manager to communicate with the installed ODBC drivers. At Django startup time, the Django Database Engine tries to import the interfaces for the ODBC managers and writes a notice to the Django startup shell window. Django can only use those interfaces which are successfully imported at this point. If all interfaces fail to load, the mxODBC Django Database Engine will not be usable. If you use recent versions of the iODBC, unixODBC or DataDirect ODBC managers, the last point is less likely, since eGenix always builds the binary distributions of the mxODBC Django Database Engine against the latest stable releases of these managers. The MS Access database uses the Jet Engine to access the database. ODBC drivers for the Jet Engine prior to version 4.0 are not thread-safe and can cause problems if used with mxODBC Django Database Engine. The connection should now be opened in auto-commit mode. Note that the data source will not participate in the Django transaction mechanism. You should only use such data sources for reading data, not writing data. Some versions of the SAP DB ODBC driver have a problem with reporting the correct scale of float columns. This should not harm the functionality of the mxODBC Django Database Engine. To work around the showstopper bugs in the driver, eGenix has added a set of compatibility features to the underlying mxODBC interface to at least make the setup mxODBC Django Database Engine + FreeTDS driver usable for standard queries to the supported databases. See the mxODBC Documentation for hints on how to setup FreeTDS to work together with the mxODBC Django Database Engine. This is a new ODBC driver from Microsoft which was ported from the existing mature SQL Server Native Client driver version 11 on Windows. It is currently only available for 64-bit Linux variants. It is more robust than the FreeTDS ODBC driver and provides better Unicode support, but also has the same issues as the SQL Server Native Client driver on Windows. On Unix, the driver is typically included in unixODBC ODBC manager binary packages, so you may have the driver already installed if you're running Django on Unix and have unixODBC installed (the ODBC driver file is called psqlodbc.so). mxODBC Django Database Engine provides backends can be used with any Django application to access database servers through mxODBC and the ODBC interface in general. The upper blue part in the diagram executes within the process of the Python application. The green part usually runs in a separate process and possibly also on a different machine. Please consult with the mxODBC Manual for further information on the configuration of data sources and ODBC drivers. The above configuration will connect to the ODBC data source (DSN) "example" using the UID (user name) and PWD (password) credentials given in the DSN entry of the Django database connection. The DSN must point to a database stored in a Microsoft SQL Server instance, since we defined ms_sql_server as the mxODBC Django Database Engine subpackage to use. Note that the database server does not need to be on the same machine as your Django application, but you have to make sure that the ODBC driver can connect to the server. There are also a few backend options supported by mxODBC Django Database Engine to configure details specific to mxODBC or the database server in use. Please see the next sections for details. String containing the full (dotted) name of the mxODBC Django Database Engine subpackage to use. Please make sure that you select the right subpackage for your database backend. This variable must be set to the ODBC connection string for the data source you have configured in the system's ODBC manager. The ODBC driver defined for the data source may support additional configuration options that you can specify in the connection string, e.g. the database name or a host name to connect to. It is also possible to use the DSN string to open connections to databases that are not defined in the ODBC manager (DSN-less connections), if you know the name of the ODBC driver and other connection details such as network locations, ports, etc. Please consult your ODBC manager/driver's documentation for details. The mxODBC User Manual also provides some additional advice on how to configure commonly used ODBC drivers. Note: While it's possible to use the settings USER and PASSWORD to define the user name and password (for compatibility with other Django database engines), specifying these values in the DSNvariable is the preferred way to setup the mxODBC Django Database Engine. Django name of the database entry. Note that the name of the database specified in the settings module has no relevance for the data source defined by the DSN setting. It is used by Django internally to identify the database and detect aliases in the DATABASES settings dictionary. You can specify the database to be used by the database entry in the DSN connection string via the Database= parameter, or in the data source setup of the ODBC manager. The details depend on the used ODBC driver and manager. Please check their documentation for details. The mxODBC User Manual has an extensive section with examples of how to setup databases connection strings and configure ODBC drivers. Database user name to connect with. You only need to specify this variable, if you have not provided the user name as UID=<user name> in the DSN variable. Password of the user to connect with. You only need to specify this variable, if you have not provided the user name as PWD=<password> in the DSN variable. See section 4.1.2Database backend options for details. Turn on/off auto commit on the connection. Auto commit means that changes on the database connection are immediately written to the database, even if the processed web request causes an error. Note that turning on autocommit should really only be done for read-only connections. A connection running in auto commit mode can easily cause data corruption in case of errors during the processing of a request. Default is to disable auto commit when connecting to the database. Set the option to True to enable auto commit. Name of the encoding to assume for 8-bit string literals that are quoted to be added literally to SQL statements built by the Django ORM. mxODBC Django Database Engine needs to apply this conversion, since it converts all SQL statements to Unicode prior to passing them to the database. Name of the encoding used to encode/decode data passed to/from the ODBC driver. mxODBC's connection.encoding is set to this value. It uses the encoding to convert text data between the database and the application, in case the ODBC driver does not know how to handle Unicode or the database requests text data while Django sends Unicode. The default value is 'cp1252' for the FreeTDS ODBC driver versions prior to 0.91 and 'utf-8' for all others. Note that default is to send Unicode data as native Unicode to the ODBC driver. See the mxodbc_stringformat option for details. Forces the conversion of all date, time and datetime objects into strings before passing them to the ODBC driver as a parameter. The conversion is disabled by default. You can enable or disable it by setting the option to True or False. Name of the database server collation used for exact string comparisons. Django's ORM expects the chosen collation to be case and accent sensitive. The sort order can be adjusted to suit your needs (binary or some dictionary order). Defaults to 'Latin1_General_BIN' for Microsoft SQL Server. Please see your database backend documentation for available collation names. Name of the database server collation used for inexact string comparisons. Django's ORM expects the chosen collation to be a case insensitive, but accent sensitive collation. The sort order can be adjusted to suit your needs (binary or some dictionary order). Defaults to 'Latin1_General_CI_AS' for Microsoft SQL Server. List of SQL statements to execute right after initiating the ODBC connection. This option can be used to implement database specific configurations of the connection, which are not possible through ODBC driver settings. Each item can be an string containing an SQL statement or a (sql, parameters) tuple. Defaults to an empty list. Name of the mxODBC subpackage / ODBC manager to use. Defaults to 'Manager', which automatically selects the appropriate ODBC Manager for the platform running the Django application. Automatically select an appropriate ODBC manager. On Windows, this selects the Windows ODBC manager. On Unix platforms, the first available manager from the following ODBC managers is chosen: unixODBC, iODBC, DataDirect. Windows ODBC manager. Only possible other option on Windows. Not available on other platforms. unixODBC ODBC manager. Unix only. iODBC ODBC manager. Unix only. DataDirect ODBC manager. Currently only available for Linux platforms. Enables monkey patching the Django Query class' .aggregate_module module attribute to allow Django ORM aggregate functions to work with MS SQL Server. The setting is enabled by default. To disable the monkey patching, set the attribute to False. This will result in aggregate ORM functions provided by Django to fail with the MS SQL Server backend due to incompatibilities between the SQL code used by the Django implementation for these functions. Enables monkey patching the Django DatabaseCache class to allow the Django ORM database cache functionality to work with MS SQL Server. The setting is enabled by default. To disable the monkey patching, set the attribute to False. This will result in database cache ORM function provided by Django to fail with the MS SQL Server backend due to incompatibilities between the SQL code used by the Django implementation for the caching functionality. Set the mxODBC string format to use. Default is to use mxODBC's NATIVE_UNICODE_STRINGFORMAT, since most drivers support Unicode today. If a driver does not support Unicode, you have to set this to mxODBC's UNICODE_STRINGFORMAT. The FreeTDS ODBC drivers prior to version 0.91 do not support Unicode. mxODBC Django Database Engine defaults to UNICODE_STRINGFORMAT for those drivers automatically. For other drivers, you may have to adjust the setting if you run into problems with Unicode data or SQL statements. Please consult the mxODBC User Manual for additional details. Note that mxODBC itself defaults to EIGHTBIT_STRINGFORMAT for all drivers in order to stay backwards compatible with older mxODBC versions. Sets the mxODBC timestamp resolution to use on connections. The value is given in nanoseconds as integer. Default is 1000000 nanoseconds, which corresponds to 1 millisecond. Using lower values can cause MS SQL Server to raise errors. You can override that default by explicitly passing an integer nanosecond value here. Please consult the mxODBC User Manual for details. Please note that you normally do not need to modify this value. Forces using of the mxODBC cursor.executedirect() method instead of the cursor.execute() method used normally. This option is enabled by default for MS SQL Server database backends, since it results in better performance and allow working around some problems with the FreeTDS ODBC driver, but left disabled for all other database servers. The syntax used for defining the OPTIONS dictionary is standard Python syntax. The following sections explain the details on both variants. The mxODBC Django Database Engine implements the ORM database engine API needed by the Django ORM to work with the database. This is the database engine name that you have to use for the ENGINEentry in the DATABASES setting of your Django projects settings.py module. Once configured, you can use the Django ORM with the MS SQL Server backend data source as usual. Please see the Django User Manual for details on how to use the Django ORM interface, in particular the Django model layer documentation. If you intend to run python manage.py syncdb on the connection, please make sure that the database user you are connecting with has sufficient database permissions to create and alter tables. For maximum compatibility across MS SQL Server versions, the mxodbc_django.ms_sql_server engine uses SQL Server datetimefields to represent Django DateField(), DateTimeField() and TimeField(). The engine takes care of automatically converting between the Python datetime module values and the database values, i.e. a TimeField() will be returned as datetime.time object, even though the database stores it together with a 1970-01-01 date. A side-effect of this is that the Min() and Max() aggregates on DateField() and TimeField() fields don't work as expected. See 6.1.4Min() / Max() and DateField() / TimeField() for details. MS SQL Server's datetime field supports a range of January 1, 1753, through December 31, 9999. Any other dates will cause an exception to be raised. Seconds fractions are rounded to the nearest millisecond before passing the values to SQL Server. MS SQL Server itself only supports a resolution of 3.33 milliseconds and rounds these to the nearest increments of 0.000, 0.003, 0.007 seconds. See 6.1.3Limited MS SQL Server datetime precision for more details. Please note that some minor limitations apply when using MS SQL Server as ORM backend. These are listed in section 6.1Known problems and limitations of the MS SQL Server subpackage. At the moment, we only support MS SQL Server as ORM backend in the mxODBC Django Database Engine. If you want to access other database backends, you will either have to try using the MS SQL Server subpackage mxodbc_django.ms_sql_server of the mxODBC Django Database engine, or directly interface to the database using the mxODBC API, which provides a Python DB-API 2.0 with many extensions. Please see the section 5.2Direct mxODBC Database Interfacing for details, if you plan to use mxODBC directly from within Django. The mxODBC Django Database Engine was written to aid in using mxODBC with the Django ORM. However, it is easily possible to also use the included mxODBC library directly for interfacing to database backends. Please see the mxODBC User Manual and Reference Guide for details on the mxODBC Python API. Importing mxODBC can be done from a Django application just like from within a normal Python script. The only difference is that you have to import the mxodbc_djangopackage before trying to import mx.ODBC. Importing the mxodbc_django package makes sure that mxODBC is configured correctly for use in Django. If you forget to import the package before importing mx.ODBC, you will get an ImportError. In this short example. we're highlighting some important details of using the mxODBC database interface in Django. It is important to note that the mxodbc_django package has to be imported prior to importing mxODBC itself. Hint: Using the mx.ODBC.Manager subpackage allows your Django application to work in most configuration settings, since it removes the need to know which ODBC manager the system is using. Once you have the connection, you can create cursors on the connection to execute statements. Whenever making changes to the database, you have to commit those changes explicitly to make them permanent in the database. If you don't, the changes will be rolled back again as soon as you close the connection. You often have auto-increment fields in databases, especially for primary keys. If you want to know which values have been created by the database, you need to fetch those values after the insert. Once you're done with using the database cursor, make sure you close the cursor to free up resources. The same has to be done with the connection. Note that closing the connection will do an implicit roll back of all uncommitted changes o the connection. There is one important aspect to keep in mind when using the mxODBC Python API directly in your Django apps: The Django ORM uses its own, mostly automatic transaction management. When using mxODBC directly, you will have to either integrate the connection transactions with the ORM or manage your own transaction management. In particular, mxODBC does not default to auto-commit mode, so you have to commit all changes to the database explicitly by calling connection.commit() (or connection.rollback() in case you want to revert the changes). Without an explicit connection.commit() call, changes will not be written to the database. mxODBC defaults to rolling back the changes, if a connection is closed without a commit. after having connected to the database. However, this is not encouraged, since doing can easily create inconsistencies in your database if your Django application runs into an unexpected error. The Django internal database API has evolved quite a bit over time. Even though most of it is now written in a way that makes it portable between backends, there are some areas which still use hard-coded SQL or make assumptions that don't apply to all database backends. In this section we list known problems and limitations with the Microsoft SQL Server subpackage mxodbc_django.ms_sql_server of the mxODBC Django Database Engine. Most of the limitation arise from the fact that MS SQL Server is missing some features used in the Django ORM, or requires a different SQL dialect than the database backends natively supported by Django. While we have tried to work around a couple of issues, some assumptions made in the ORM cannot easily be fixed without changing the ORM code and making it more portable. mxODBC Django Database Engine currently only supports Django ORM integration for Microsoft SQL Server 2005, 2008 and 2012. We will add support for other database servers in future releases. Note that the Django ORM integration is available on all supported platforms, not only Windows, provided you have an ODBC driver available for the platform. On Linux, we suggest looking at the official Microsoft SQL Server Native Client for Linux. On other Unix platforms, the FreeTDS ODBC driver or one of the many commercial drivers can be used. The ODBC API does not support passing or retrieving timezone aware date/time values. As a result the underlying mxODBC cannot easily support timezone aware datetime objects. In order to maintain compatibility with Django 1.4 and later that support the USE_TZ setting, the mxODBC Django Database Engine ignores the .tzinfoattribute on datetime objects passed to the adapter. All date/time data read from the database will also not have the .tzinfoattribute set. We recommend not using the USE_TZ setting when using MS SQL Server as database backend. It is best practice to store date/time values as Universal Time (UTC) in the database and to apply any locale dependent conversion in the UI layer of the application - based on user, browser, session or system preferences. Likewise try to avoid implicit conversion of datetime values to strings. MS SQL Server interprets such literal date/time values in a locale dependent way, which can lead to surprising results. MS SQL Server datetime fields only have an accuracy of 3.33 milliseconds, or short 0.00333 second, not the microsecond accuracy of Python datetime objects. Furthermore, it rounds to the nearest increment of 0.000, 0.003, 0.007 seconds. This can lead to unexpected behavior when querying date/time or time ranges, esp. when using non-inclusive upper limits in range queries or when inserting timestamps which could be subject to unwanted rounding. Instead of datetime(2008, 12, 31, 23, 59, 59, 999999) you may have to use datetime(2008, 12, 31, 23, 59, 59, 997000) as date/time value, since using 999999 microseconds could cause rounding to datetime(2009, 1, 1, 0, 0, 0, 0). The mxODBC Django Database Engine uses datetime fields for Django DateField(), DateTimeField(), TimeField(), so the above applies to all those Django ORM fields. For the same reasons as above, it is also good practice to not use mixed date/time comparisons or filtering, such as comparisons of a DateField() with a DateTimeField() in a filter. Always try to use comparisons/filtering between same-type date/time fields to avoid introducing bugs into your application due to rounding, e.g. DateFields() with DateField(), or DateTimeField() with DateTimeField(). Because DateField() and TimeField() Django fields are mapped to SQL Server datetimefields, the SQL aggregate function MIN() and MAX() on these fields will return datetime.datetime objects when queried from the database. As a result, the Django aggregate functions Min()and Max() will return datetime.datetime objects as well - even when used on DateField() or TimeField() fields. Since the needed field information is not available to the ORM aggregate functions and Django doesn't provide a clean way to override them, this cannot be changed. When using the FreeTDS ODBC driver on Unix systems, applications may be limited to the character set of a specific encoding, since FreeTDS has only just started supporting Unicode natively in recent releases. Some unit tests in the Django unit test suite fail due to this limitation when running on a Unix system with FreeTDS. Note that mxODBC Django Database Engine will automatically default to 'cp1252' when using FreeTDS on Unix and 'utf-8' when using the SQL Server Native Client ODBC driver on Windows. There is no generic support for deferred checking of foreign key constraints in Microsoft SQL Server. As consequence, mxODBC Django Database Engine does not allow using this feature and raises an exception whenever there are conflicts due to foreign key constraints, e.g. when trying to load data in the wrong dependency order. Some unit tests in the Django unit test suite fails due to this limitation. If you must support forward references or cyclic references in your database schema, the only option is to define the respective columns as NULLable, insert the rows with NULLs (None in Python) in those columns and then set the values in a subsequent rounds of updates. Microsoft SQL Server 2005, 2008 and 2012 do not directly support the usage of regular expressions. mxODBC Django Database Engine currently emulates the most trivial regular expression patterns using a stored function created when you create your database tables with the first syncdb operation. Note that the user running your application will need execute privileges for that stored function if you use __regexor __iregex conditions in your code or one of the Django add-ons you use. MS SQL Server does not support comparing nvarchar() and ntext columns for equality. The same is true for comparisons with other variable length column types (ntext, text, image). With SQL Server 2012, Microsoft has decided to deprecate these variable size column types. See this MSDN article for details. The Django ORM can trip over this limitation in the implementation of generic relations. Note that the MS SQL Server subpackage of the mxODBC Django Database Engine does not use the above variable size column types, so you will likely only run into this situation when interfacing to database not under Django ORM schema control. You can either avoid using text, ntext and image column types in the database schema or explicitly cast the variable size column types to limited size column types. In order to support the different SQL dialect used by MS SQL Server for aggregate functions, the mxODBC Django Database Engine has to patch the Django ORM Query class and provide a customized aggregates module so that requests for aggregates get converted to SQL code which is compatible with MS SQL Server. Unfortunately, the Django ORM does not allow providing such customizations on a per-database backend basis. The patching of the Django ORM can be disabled, if needed, but since we assume that most Django ORM users will use only one database backend per application, we have enabled the patching by default. Please note that by doing so, some aggregate functions used by the ORM will no longer work with the MS SQL Server backend and cause tracebacks. For the same reason as in the previous section concerning aggregate functions, the mxODBC Django Database Engine has to patch the Django ORM DatabaseCache class. The Django ORM assumes that all database backends support the LIMIT/OFFSET SQL syntax for limiting the result set to a predefined window. MS SQL Server does not support this syntax, which is why we had to provide different queries for the cache implementation. We also had to make sure that the ORM only uses non-aware timestamps for the caching. Note that the MS SQL Server backend is not usable as database cache in Django when disabling the patch. 6.2.1 How do I determine the correct collation values? Please consult to the manual of your database server for the list of valid collation names. You can find more information on the Microsoft SQL Server MSDN Web site. You can list all the collations supported by Microsoft SQL Server using the SQL Server Management Studio GUI administration tool. The complete list is shown when starting the Create Database wizard under the Options tab. The SQL Server Management Studio will also show you the currently set database default collation in the database properties. 6.2.2 How do I implement full regular expression search? MS SQL Server does not have native support for regular expression, so the only option you have is to work around this by filtering the records using the Python re module. Please make sure you installed mxODBC Django Database Engine into the same Python instance as your Django based application uses. Try to open the command line interpreter of the same Python instance and import the subpackage from mxODBC Django Database Engine manually with a single import statement and watch for an ImportError. Make sure you did not mistype the name of the mxODBC Django Database Engine subpackage and that you entered its full (dotted) module name, not just the name of the subpackage. See the example settings above. Please make sure you have a valid mxODBC license installed. Please visit the eGenix.com web-site to obtain a license. This software is covered by the eGenix.com Commercial License Agreement, which is included in the following section. The text of the license is also included as file "LICENSE" in the package's main directory. Please note that using this software in a commercial environment is not free of charge. You may use the software during an evaluation period as specified in the license, but subsequent use requires the ownership of a "Proof of Authorization" which you can buy online from eGenix.com. Please see the eGenix.com mx Extensions Page for details about the license ordering process. By downloading, copying, installing or otherwise using the software, you agree to be bound by the terms and conditions of the following eGenix.com Commercial License Agreement. Have a look at the ./bin/django-admin.py startup file in your Django directory to find the path to the Python interpreter. In future versions of mxODBC Django Database Engine, we plan to optionally make use of the date and time fields, that were added in SQL Server 2008. If you setup an auto-commit connection, all changes will be permanent immediately, so you don't have to call .commit(). However, you also lose the possibility to easily undo changes.